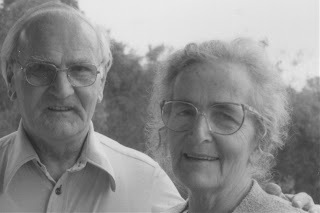 Another chapter in the history of Papua New Guinea has come to a close with the death of Helene Holzknecht (nee Schmutterer, pictured above with her beloved husband Karl). Her death also marked the end of a colourful era in the history of the Evangelical Lutheran Church, Lae, Morobe Province, and PNG as a whole. Hers is a story of pioneering spirit, love, the horrors of war, and a country and people she grew to regard as her own. Mrs Holzknecht died on Tuesday, August 26, 2003, after a long illness and was laid to rest at Langmeil Lutheran Church in Tanunda, South Australia onWednesday, September 3, 2003, beside her beloved husband ‘Bingsu’ Karl Holzknecht. Helene Holzknecht nee Schmutterer was born on February 28, 1917, at Sattelberg Station near Finschhafen. She was the third child and daughter of Gottfried Schmutterer and his wife Magdalene Pfeiffer, pioneer missionaries of the Neuendettelsau Mission Society in Lae. Sometime during her first year, one of her older twin sisters, Elfriede, died of suspected meningitis. A younger brother, Wilhelm, died years later in Germany. Helene spent her first eight years at the Ampo mission station, now the headquarters of the Evangelical Lutheran Church of PNG, playing with and getting to know the children of Butibam and Kamkumung villages, as well as people from Bukawa, Labu, the south coast and the hills behind Lae. At eight, Helene was sent back to Germany with another missionary family to attend school while her parents remained in New Guinea. She lived with other missionary couples at the Neuguinea Heim in Neuendettelsau, attending local schools. From Neuendettelsau, Helene entered and completed nursing training at Schwaebisch Hall, and then Augsburg, where her father was then stationed as pastor. During her parents’ periods of furlough in Germany in Neuendettelsau, she had met a young seminarian by the name of Karl Holzknecht who regularly delivered the Mission Society’s magazine, Concordia, to her parents and a friendship developed, followed by an engagement. Helene’s wish to return to her people in PNG was realised when her then fiancée, Karl Holzknecht, who had been originally slated for mission work Brazil, was sent to New Guinea to meet the manpower needs of a rapidly growing mission field. She followed Karl to New Guinea and they were married in her father’s old church at Ampo, Lae, on December 17, 1938. The newly wed couple’s first posting was as support missionaries at Malalo near the then – burgeoning gold mining town of Salamaua, undertaking pastoral visits to villages by outrigger canoe down the coast as far as Sipoma and Paiawa, and by foot into the ranges behind the station to the Hote and Kaidemui people. Helene accompanied her husband on all but the trips along the Black Cat Trail into the Wau and Bulolo valleys, ministering to village women and helping the sick she found in these areas. The outbreak of war in Europe in 1939 brought this idyll to an end. Karl – being a German - was taken prisoner as an enemy alien by Australian authorities, leaving a pregnant and heartbroken Helene at Malalo. After long trips by plane to Australia and then by train to South Australia with other missionary wives and families, Helene and Irene were eventually placed with the Pech family in Appila, a sanctuary for which Helene was always grateful, making close friendships with the Pechs and their extended families which were retained all her life. Helene soon worked with other evacuated wives to obtain permission to join their husbands at the internment camps at Tatura, Victoria. This was eventually granted and Helene and Irene joined Karl in the family camp at Tatura where more friendships were made especially with a group of Palestinian Templar families. During their enforced stay at Tatura, Helene and Karl’s two older sons, Gottfried (Fred) and Hartmut were born on January 3, 1940, and May 22, 1945, respectively. The three children joined the other camp children in school and other activities. Once hostilities in Europe ceased, many mission families sought release from the Tatura camp, most opting to be repatriated to Germany once their cases had been examined by the local tribunal. Helene and Karl decided that their families in Germany had few resources to cope with themselves, let alone with another five mouths to feed, and opted to remain in Australia pending approval to return to the mission work in PNG. The family moved to Queensland, finding initial accommodation with Missionary Lehner and his wife in South Brisbane, where Karl worked and helped on Sundays as a guest preacher. Eventually approval was given in early 1947 for Karl to return to PNG, as the first German Lutheran missionary to go back. He was sent to rebuild the mission station at Kaiapit in the Markham Valley, first organising suitable housing so that the family could join him three months later. Helene soon took on the task of establishing regular health, women’s and baby clinics, looking after the boarding school girls when the school was re-established, and training girls in the household, the way her mother had at Ampo. Sewing, cooking, ironing, literacy were all things that the future wives of pastors and leaders learned at Kaiapit – in addition to basic hygiene and health. Helene’s family soon grew with the addition of two more sons, Philip and Erich in 1949 and 1951 respectively. The older children had started school, first at Sattelberg and then at Katherine Lehman School, Wau, where all five currently went. Following leave in 1969, Karl and Helene moved back to Ampo, Lae – back to Helene’s roots. Her friends from Butibam and Kamkumung were now the elders of the community, but the friendships forged in childhood remained strong. Karl’s translation duties with the Jabem Bible and later the Wampar language New Testament also allowed Helene a continued interaction with the people she loved the most. She was often torn between her remaining family and friends in Germany; her own family in Australia and her loved ones in the villages of Papua New Guinea. Increasing personal health issues necessitated a move from New Guinea to Australia, where they first settled at Fernvale in Queensland near Philip and his family. Amongst the many people Helene befriended in Ipswich was the son of one of the Palestinian Templar families who had been at the Tatura camp and Helene and Karl rekindled a friendship with him and his wife. Every brown face she saw in the streets of Ipswich reminded her of her people in PNG. At the end of 1989, Helene and Karl moved to Tanunda to be near son Erich and his family, first living in Jane Street. Deteriorating health forced a moved to the Tanunda Lutheran Home where she saw out the rest of her life. Helene is remembered by most people she met as ‘Mutti’ – a name which sums up what she was to most people who knew her. She loved people, loved being with people, helping and being part of what was going on, despite growing frailty. To her children in Adzera, Jabem, Wampar and Lahe, she was ‘Misi’, a figure of love, honor and respect. But even there, she became ‘Mutti’ to many of her children’s friends. ‘Mutti’ will be remembered for the wicked sense of humour she inherited from her father, for her ability to use three or four languages in one conversation, for her quaint use of the English language, for the love and pride she held to her father and his achievements, but most of all for the love and pride she held for her children and grandchildren – her insistence on seeking knowledge and understanding it, and the love and unforsaken faith she had in her Saviour. Helene leaves behind her older system Lydia, younger brothers Gerhard and Friedel and their families, as well as her children Irene, Gottfried, Hartmut, Philip and Erich and their partners Terry, Dawns, Sue, Rhonda and Sonia, 11 grandchildren: Aedin, Richard, Erik, Misha, Martin, Richard, Sara, Heidi and Karin, and nine great grandchildren: Ryan, Emlyn, Indica, Sebastian, Alec, Zak, Peyote, Liam and Acacia, with two more on the way last year. ‘Mutti’ is remembered with love and affection by all who knew her and whose lives were touched by her. She rests now in the hands of her Saviour, free from all her trials and tribulations.